1) dumped roughly 1/2 gallon of milk in the inner pot. 6) set inner pot on counter, waited for the milk to come down to 110. 7) turned the IP off - put the lid back on to hold in heat. 8) after the milk came to 110, I tempered a bit of the milk with about a TBSP of starter yogurt. 9) then mixed that back in to the pot, whisked it around. 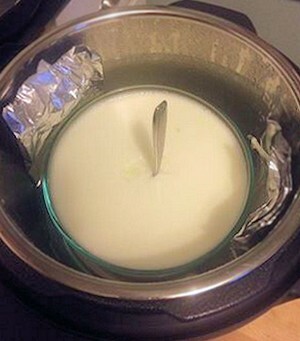 10) then I actually poured the milk/starter into another dish because I don't have a second pot and didn't want it to be out of commission, if you don't mind having your inner pot out of commission for a day or so, just put the pot back in.